Humans have often looked to nature to build better machines. Professor Michael Milford discusses what path-finding robots can learn from the experts in this subject: rats. Professor Michael Milford published his first textbook at 18. Having finished a set of first-year university exams a week before his mates and, with nobody to go out partying with, he “wrote a little maths textbook”. It sold out that Christmas, and he’s now been writing books for nearly two decades. Only recently, however, has he realised that while he’s moved many copies, they’ve targeted the wrong audience. “About five years ago, I had an epiphany that the people who were buying my textbooks and other textbooks like mine … those people were already pretty empowered to seek out help,” he told create. What about those who weren’t keen on maths, and who had maybe even viewed it as boring — even though it’s behind all the technologies that are reshaping the world? Where are the educational materials for the disempowered? “People who’ve either dropped off out of school, or where the school hasn’t really resonated, people from disadvantaged backgrounds — they are going to be the people who really shape the future of humanity, which is the ironic thing,” he said. Milford’s answer is to ‘hijack’ popular media, putting maths concepts into the language of video games, blockbuster movies and young adult books. To reach kids, you have to speak their language. “That’s the only way I think to make it really stick,” he said. Milford’s efforts have gotten enough traction that representatives from “pretty much all of the major movie studios” invite him to review premiere screenings. He has also written 12 combination movie reviews and maths lessons for The Conversation website. Star Wars film Solo, he said, is “plausible, given a healthy dose of future (or, strictly speaking, past) technology from another galaxy,” while Spider-Man: Homecoming is “entertaining and accurate”. But efforts to raise maths and science literacy are only one part of Milford’s packed life. 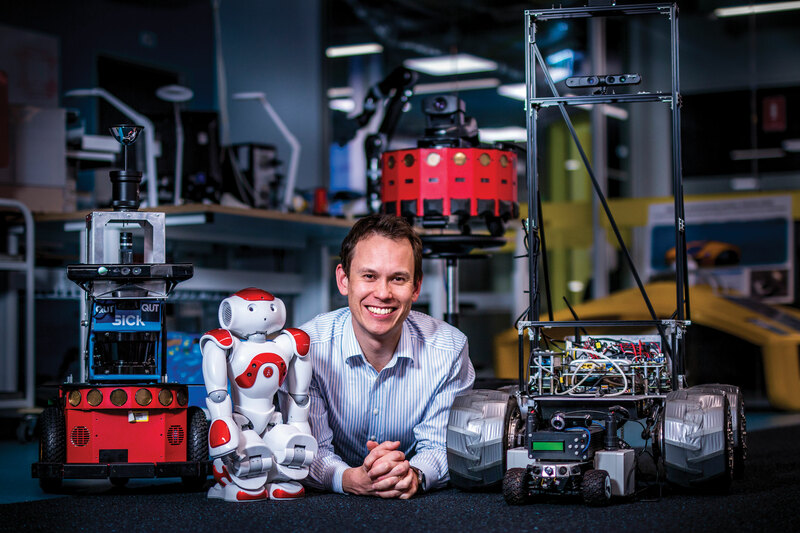 He is also a busy public intellectual, a father of two young children, and the Chief Investigator at the Australian Centre For Robotic Vision, where he researches biologically inspired artificial intelligence. The brown or common rat is an incredibly versatile rodent. It can live almost anywhere — deserts, tundra and polar ice are the exception — and females produce up to 50 offspring a year. These rodents are also impressive at getting around, using a system of runs, often underground, which they learn thoroughly. “I didn’t think about them much until I started my PhD,” said Milford, who graduated with a space and mechanical engineering degree before changing direction. 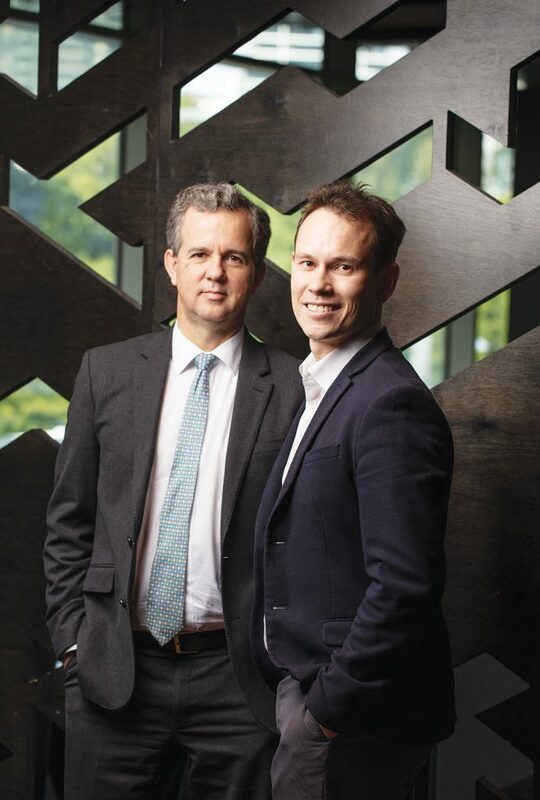 QUT’s Professor Gordon Wyeth (left) with Milford. Around 1996, Professor Gordon Wyeth, now Executive Dean of the Science and Engineering Faculty at Queensland University of Technology, was looking to biological models of navigation. Rats and other creatures had something roboticists wanted. “Animals seem to navigate around the world seemingly effortlessly,” he said. It was Professor Janet Wiles who suggested he consider the hippocampus, an area long believed to be associated with navigation. Wyeth and his PhD student Brett Browning began work on rat hippocampus-inspired navigation methods. Interesting results led to preliminary Australian Research Council funding of PhD scholarships for David Prasser, who focused on the vision system, and Milford, who focused on the software. The team replicated what was observed in rats based on place cells, discovered in 1971, and head direction cells, discovered in the 1980s. Place cells fire when a rat walks up to a certain location. They are believed to help the rat build an internal map. Incorporating these two types of cell into a robot’s continuous attractor network-based representation of the world was not enough, and significant errors accumulated as it built a map. The researchers invented a third neuron type for RatSLAM — the acronym stands for ‘simultaneous localisation and mapping’ — that would encode both orientation and location, and published the results in 2004. “What we found was that representation alone was really bad at dealing with the fact that the senses that you put on a robot are not perfect, sometimes they have errors, they’re noisy,” explained Milford. He said that previous SLAM methods recognised this and used probabilistic approaches for that reason. The pose cells have similarities with ‘grid cells’, which are believed to handle path integration and were discovered in 2005 by Edvard and May-Britt Moser. The Mosers shared the Nobel Prize in Physiology or Medicine in 2014 with John O’Keefe, who discovered place cells. 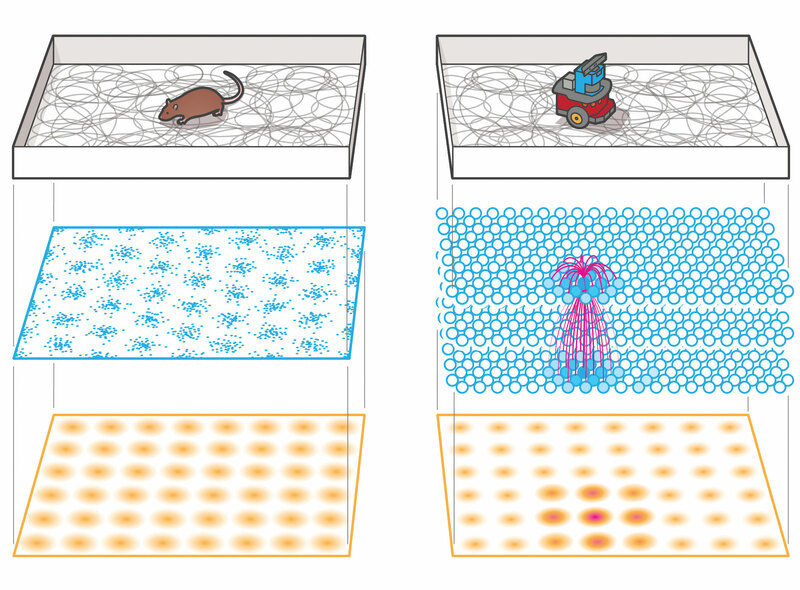 As a rat explores an unfamiliar area, the spiking of a neuron called a grid cell (shown as blue dots, middle left) reveals a hexagonal pattern (bottom left). As a robot running RatSLAM moves around, nodes in the algorithm’s attractor network respond with a spiking pattern (middle right), much as grid cells do, forming a similarly regular pattern (bottom right). Wyeth said having a third degree of freedom enabled their breakthrough result, which used RatSLAM to map a 66 km car trip in St Lucia with a Macbook camera operating at 10 Hz and with a resolution of 640 by 480 pixels. Published in 2008, this was by far the largest area ever mapped by camera-based SLAM. “It definitely caused waves, and, at the same time, we got a lot of support as well,” Milford said. Wyeth remembers the response differently. After roughly a decade-and-a-half of development, RatSLAM is being trialled in a collaborative project for underground mining vehicles between Caterpillar, QUT, Mining3 and the Queensland Government. The project, assisted by an Advance Queensland Innovation Partnership grant, combines SeqSLAM and other methods to determine the position of underground mine vehicles. 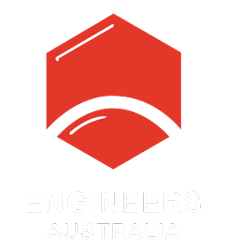 In the world of mining automation and other field robotics applications, Australia is globally regarded. 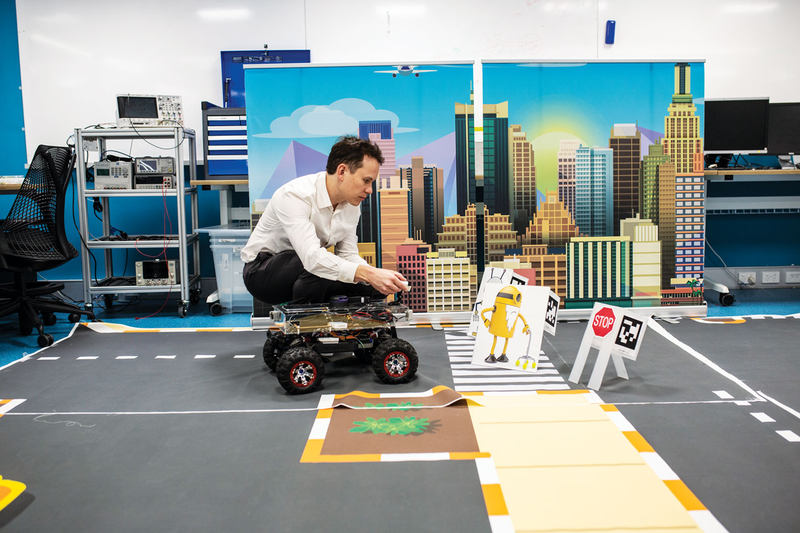 The Australian Centre for Robotic Vision recently took stock of the country’s prowess and opportunities in its Robotics Roadmap, which found 1100 firms that are “service businesses within major corporations or small-medium sized enterprises”. Concerns do exist around a brain drain of robotics specialists, which does nothing to help make the best of a future that increasingly features autonomous systems. Writing about autonomous cars in July of this year, Milford counted about 20 recent alumni from the QUT lab that were departing for overseas research or industry positions, mostly in Europe or the United States. Brain drain from universities or from a particular country “isn’t a problem if some people come back,” he wrote, “but so far the exodus of talent has remained mostly one directional”. Asked about the issue, Dr Sue Keay, the Chief Operating Officer of the Centre, said one of its aims is to produce 80 PhD graduates. “Once we have graduated those students, it would be a shame if all that talent just ends up moving overseas,” she said. Keay said the Robotics Roadmap, which she chaired, showed that “amazing” opportunities to make an impact exist here, and that the future depends on both communicating this and in clustering expertise from universities and industry. “We are going to struggle to put together all the fragments of the robotics industry in Australia if we lose that talent overseas,” Keay added. Dr David Ball, a long-time friend of Milford’s and a one-time collaborator on OpenRatSLAM, said the movement of Australian researchers overseas and into industry are distinct issues. While Australian academics move to overseas universities, many researchers move here, a situation that is not new. 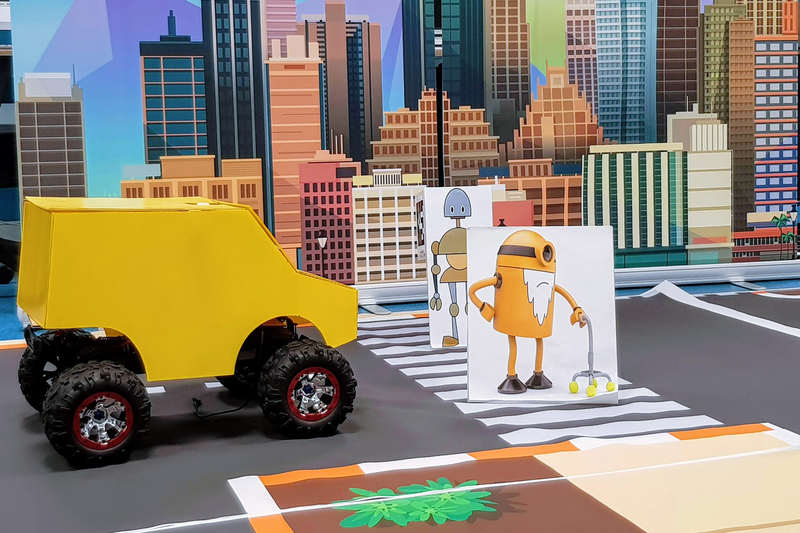 “The movement of robotics to industry is new,” said Ball, who is Senior Technical Program Manager at Boston-based driverless car software company nuTonomy. “The movement around the world is probably not as new for Australia … but there’s this feeling at the moment that robotics is on the cusp of commercialisation of a lot of technologies. Asked why he’s staying put in both Australia and a university, the first thing Milford mentions is the importance of the impartial, evidence-based input that university experts can lend to public and policy discussions on disruptive new technologies. “We can say things that people from a company and people from government can’t say, and I think that is one of the most valuable roles of a university: to be as unbiased as possible,” he said. His considerable outreach efforts have included around 50 public talks this year. Milford has written that the bright technologists who remain in academia tend to be academic idealists, are able to consult on the side, or have family reasons. “I like to think of myself as an extremely cynical idealist,” he said: an idealist at core but extremely pragmatic in how he supports these views. His current pragmatic, “bread-and-butter” projects include “very applied research”, such as with Caterpillar, and work assessing how autonomous cars will interact with cities and infrastructure. 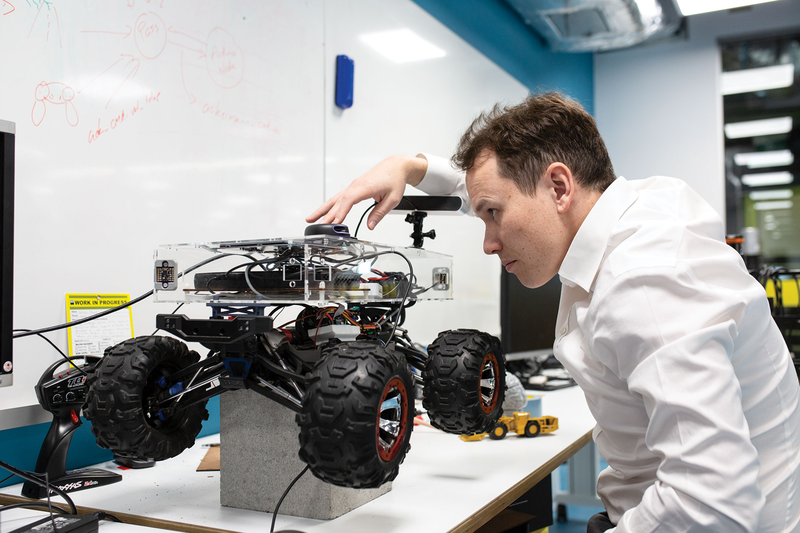 As well as these, he is the lead researcher on a new joint project with the Queensland Department of Transport and Main Roads and the iMove Cooperative Research Centre, which is investigating how autonomous vehicle technology will interact with infrastructure. The project is developing a research car platform equipped with a range of state-of-the-art cameras and LIDAR sensors used on autonomous vehicles and will gather thousands of kilometres of data from urban and rural roads under a wide range of weather and day and night-time conditions. It aims to inform and guide future development and investment in infrastructure. “I’m also increasingly looking to go back to really blue-sky, fundamental research,” Milford said. This blue-sky work is being supported by the US Air Force Office of Scientific Research. It involves data compression methods inspired by the way one brain cell, used in the brain’s GPS, can be used to represent so many different places. What can be learned and adapted from a brain might be infinite. At any rate, it’s a rich source of inspiration for Milford. “If you distil every piece of human history, every single decision that’s ever been made, it’s all come down to this,” he said. This article was originally published as “Maze Runner” in the November 2018 edition of create.